Bohemia Interactive have been a gaming studio behind military simulations now since 1999. It all started with Operation Flashpoint that for some of you might hold some dear memories. Back in the day, that game was among the top rated person shooters and since then it always had a special mention among the greats when talking to shooting fanatics. When the ARMA series was announced, Bohemia Interactive took a major flip in their game design, aiming for realism and ousting many of their original fans that were expecting another rollercoaster action feel like Operation Flashpoint. As a result the company has mostly been flying under the radar until last year when ARMA 2 exploded thanks to its DayZ mod. But for players like me, and the core community of ARMA, the game will always be known as the game that made us more familiar with the military. With ARMA 3 lurking around the corner, and DayZ getting its own standalone, the community looking for the ultimate military simulator need only wait a bit longer to recapture the glory days of ARMA 2. Thankfully I landed a spot in the ARMA 3 alpha to preview the next iteration of the series. This is no rollercoaster game carried by an unrealistic storyline catered towards kids with short attention spans. 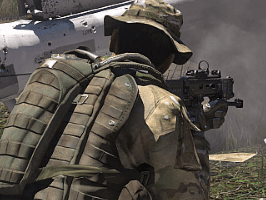 ARMA 3 bleeds realism without losing out on the epic clash moments you would expect in more popular shooters like Battlefield 3 and Call of Duty. Even though the game has only been in alpha testing for a little over a week, the strong community that was vital to past ARMA titles is present and larger than ever before. Currently we only have one official map available in the game. The reason I say official is because I have already seen some of the ARMA 2 maps ported over but they don’t really function properly yet. But this takes some time to notice as you’ll just be wowed by how far the graphics have come since the previous iteration. They have been pushing this fact at various trade shows and with good reason. Unfortunately the game seems to have carried over many of the bugs and engine problems as ARMA 2, but I guess that’s to be expected at the start of alpha testing. Thankfully this alpha is bringing in plenty of testers so we can quickly address the major problems and get them fixed pre-launch. While on the note of graphics I have to make mention of the new interface. ARMA has always been a series that felt like its developers didn’t care enough to put together a functional smooth UI. However, Bohemia seems dedicated to changing this reputation as even in this early alpha test their new UI is wonderful. Here’s hoping the DayZ standalone follows their lead as I am truly pleased with how much they have improved since ARMA 2. But enough praise. Let’s cut to what I feel they are doing wrong. And the first complaint I have is the time period the game is set in. The story takes place in the mid-2030s during the fictional Operation Magnitude, which is a military operation launched by the NATO forces fighting in Europe against Eastern Armies led by a resurgent Iran. I mean sure, I don’t really mind what the story is, or the time period it plays out, but what actually bothers me are the weapons present. As a military simulator, I want to expect realism, and Bohemia has always been pro at delivering on this. But some of the equipment and weaponry present in the Alpha just feels like science fiction to me. Shooting underwater is a hard feature to accept as well. Anyhow, while a major turn-off, this alone isn’t enough to turn me away from the series. I just hope others feel the same and raise their voices so we can get some adjustments to these unrealistic concepts prior to launch. One of the major redeeming factors that made me so forgiving of the faults is the new Ragdoll physics. This might seem like a standard feature for shooters in 2013 but it’s still worth pointing out that ARMA 3 got it right. Well it’s still a little buggy, but it does improve the overall experience. They have made some huge changes to the environment including underwater battlegrounds that make the world feel more alive. In ARMA 2 I felt the environments were just too grey and felt overall dead (no wonder it was prime real estate for a zombie mod). ARMA 3 in contrast has incredible texturing, with beautiful grass, trees and proper volume to the small elements that make the world feel more 3D and alive. The weather system has been overhauled and breathes even more life into your surroundings. Facing a heavy rain storm? Expect to trudge through a grey heavy atmosphere reflecting the weather from every aspect it should affect. Even the clouds have varying levels of thickness and design to make the sky realistic and reflect the coming weather. And when it’s sunny, the entire world reflects vibrant colors. You know it’s well done when you start second guessing if you’ve been to an area before simply because of a weather change. Even though the game is only in alpha yet, and we have probably seen only ten percent of the available content, I must say that I am psyched for the full release of the game. The game is so much different than before, and on all fronts improved over ARMA 2. Most of the most jarring bugs such as randomly breaking your leg on rocks are gone, and the only truly annoying bugs that remain involve random crashes. Even though I am not a big fan of the current small map that is available in the game, I already see its full potential worked out through the different missions and mods the community is making. Currently the game is cheaper than it will be in the beta or full release of the game, and I recommend you take advantage of this while it’s still cheap. If you need your realistic military shooter fix, this game IS for you. And even if you fall into the action packed rollercoaster shooters, I’ve seen community driven deathmatch and co-op missions pop up that will even satisfy your style of play.